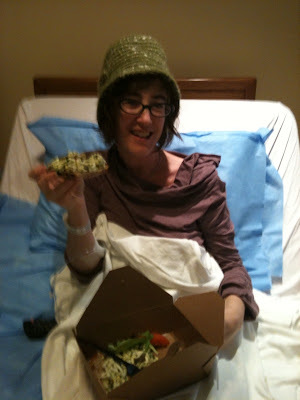 Except for my pre-infusion breakfast from Le Pain Quotidian, which was an egg salad tartine. Never to be eaten again. And so began my second day of chemo, this time with a Cisplatin IP infusion, inserting chemicals directly into my abdominal cavity, two liters there and two in the IV. My dear friend L. tended me thru it all and A. arrived to add a bit of massage to my day. From 9-5 it was a long day and I was thankful to get home and get in bed. The aftermath has been wretched. With nausea and all of the other attendant pains I wonder how I will ever make it through the rest of my treatments. I am on three different anti-nausea meds and still can barely eat more than a few bites at a time. I started my day with a few spoonfuls of oatmeal with blueberries and then tried a few sips of a peach smoothie later. Dinner was a dumpling or two with a bite of chicken. On the bright side, Claudette was here to tend to me and entertain Izzy until he went off on another playdate at his friend's I. 's house. Just checked in to see what's cooking after a long hiatus, & after a shock, browsed your most recent posts on your illness. I'm a stranger to you, but your lovely blog has brought you into my world as a friend from my old hometown. This has been a hard year for me. I lost a son, & a dear mom-in-law. The aftermath has been ugly, I'm learning to live as an amputee without a chunk of my heart, but I am surviving. You will, too. You're a tough cookie. What I've learned is this: The only thing we really have is our memories of yesterday, and TODAY. Tomorrow is never a guarantee for any of us. Ever. So to worry TOO much about it is really to waste priceless time TODAY. What you do with today is what matters, because that will form your memories and others'. Tomorrow is always a blank canvas, and we only get to paint on it TODAY. Enjoy today. I'll be here, one mommy rooting for another, as you go through this. You have a lot of us who are carrying you and your family in our thoughts, prayers, and hearts, dear lady. Take care not to eat your favorite foods on those days, lest you'll be left with no favorites at all!